Got up this morning at 4 again. Natural Calm didn’t really work, but I’ll try it again tonight. 12:00 – We bbq’ed some country pork ribs. I ate half a slab with Paleo BBQ sauce. I didn’t eat that many veggies because I was in a rush to head to the mall. 3:30 – Came home and ate more ribs. Came home from the mall, and didn’t feel too great. I was trying on dresses at BCBG, and I went up to a size 4. It’s probably because of my lats, but my tummy was feeling really tight too! I really need to lose some inches. 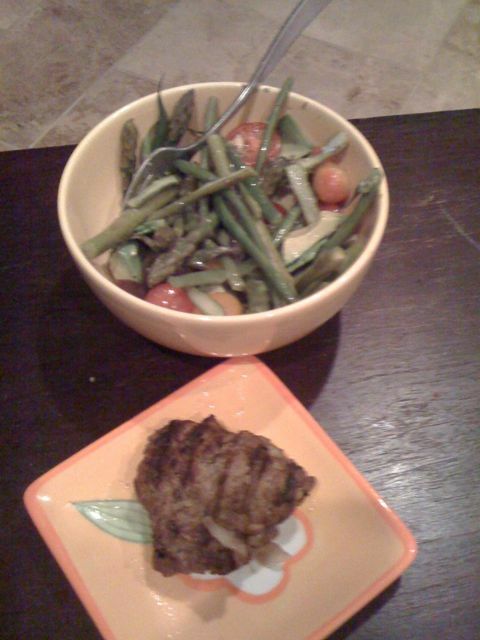 7:00 – Asparagus/Beans salad courtesy of Sweet Cheeks! Here is the recipe! It was delicious! I had a small beef patty with this.